I'm fairly certain handbag designers don't particularly care whether I think their bags are good or not, but I hope at least some of my readers value my opinion and consider it more than just that. I'm not just a handbag lover and collector, I'm also a critic. By critic I mean I look at every bag and judge it on its' own merits as well as how it fits into today's market. Not only are aesthetics important when I recommend a bag, but pricing is also a pivotal factor I take into account when I browse the web and scour the stores for the latest trends. In the end, my decisions are a mixture of brains and gut instincts. That's how I buy and collect my own handbags. It's always worked for me, and I'm sticking to my formula because "If it ain't broke...". Now that 2008 is behind us, I've had time to think about the bags that defined the year - the best of the best. I narrowed my picks down to two very beautiful and stylish bags which are as different as night and day. My first pick is the YSL Majorelle Bag. It's no secret YSL is my favorite designer handbag label. The Majorelle embodies all that is great about this iconic label. Classic, sophisticated and exquisite handbags are what women have come to expect from YSL. Although there was some debate over whether or not the Majorelle looked a bit too much like a "granny bag", I believe the simple design of the Majorelle only serves to enhance the colors and finishes that YSL can come up with. My second pick, the MARC by Marc Jacobs Dr. Q Lil Riz Hobo, is a more inexpensive option but nonetheless worthy of praise. If YSL is my favorite high-end designer handbag label, then MARC by Marc Jacobs is my favorite moderately-priced designer handbag label. Their handbag collections are filled with fabulous and stylish bags, and the Dr. Q Lil Riz Hobo is a perfect example of why this label is so successful. Although MARC is targeted for a more young, hip crowd, the overall simplicity and quality craftsmanship of their designs appeal to women well into their 40s and 50s (my last trip to Nordstrom was proof of that). The Lil Riz is a fine hobo with its' relaxed shape, sturdy top handle and well-appointed interior. The ample 13.5 x 11.5 x 3.5 size makes it a great choice for a day bag, but its' chic look will work in the evening as well. While 2008 is over, it doesn't mean the standout bags of the year should be forgotten. Both these styles are very much available, and I recommend them with the same enthusiasm as I did last year. The YSL Majorelle Bag in purple patent leather is on sale at Overstock.com reduced from $1395 to $1099. 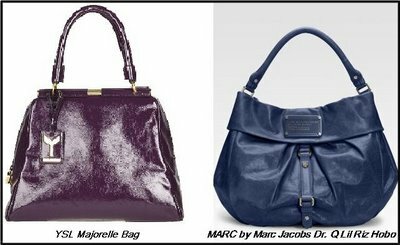 The MARC by Marc Jacobs Dr. Q Lil Riz Hobo is available in both light brown and a fantastic indigo blue for $428 via Saks.